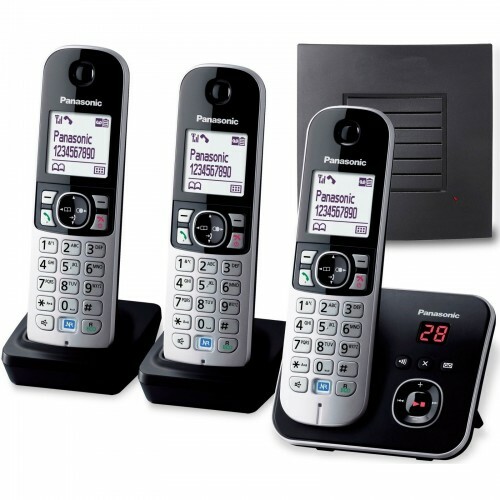 The Panasonic KX-TG 6823 Trio is a stylish and practical set of digital cordless phones. Each handset boasts a large 1.8-inch white back-lit screen and illuminated keypad for easy navigation and great visibility, even in the dark. And included with the phones is a Panasonic range extender so that you can enjoy calls all around your home. The KX-TG 6823 comes with a high-precision error correction system that eliminates sound glitches so you can enjoy crystal-clear, interference-free conversations. There is also a noise reduction key you can press to reduce background noise by up to 75% when you step into a noisy environment. With mulitple handsets, you can take advantage of features such as: call transfer, conference, intercom, and phonebook transfer. A Night Mode function enables you to set specific times when you don't want to be disturbed so the phone won’t ring and instead will flash silently when you have an incoming call. The 6823 is also Caller ID enabled so you can see who’s calling, access details of the last 50 callers, and use the Call Barring feature to reject specified phone numbers. If you’re looking for a reliable set of digital cordless phones with extra long range, then the Panasonic KX-TG6823 with Panasonic KX-A405 Repeater offers excellent value for money. The phones were easy to set up and the repeater was pretty simple too. I haven't mastered the Noice Reduction and Handset Equaliser functions so I'm not sure about the sound quality. Our [very rural] line is not very good and I haven't found a way to make either of these functions yield anything in the way of an improvement. There are lots and lots of features some of which we may never use and others which will take time to get into. Generally speaking we're pleased with these phones. The extra cost of the Repeater seems somewhat excessive. The phones look good in our home and were very easy to set up and use. The repeater was not so easy to set up but the support from ligo was excellent and they were able to help so now have phones that work on all 3 floors of our home! Well worth it!